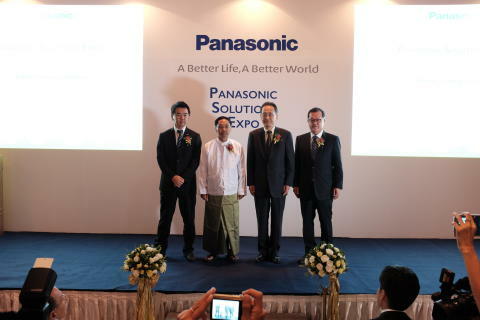 18 November 2014, Yangon, Myanmar – Panasonic Solutions Expo opened today at the Sule Shangri-La Hotel; the first big scale showcase of the company’s full suite of technology, business-to-consumer (B2C) products and business-to-business (B2B) solutions available in Myanmar. 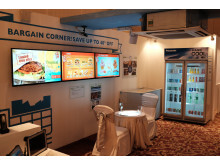 The Expo spans across six experiential booths – Corporate Branding, Residential, Energy Solutions, Hotel, Education and Convenience Store – to bring about ‘consumers and business partners’ for consumers and business partners. 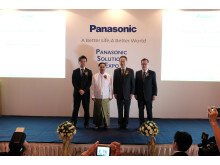 “Panasonic has identified Myanmar as one of Asia Pacific’s strategic markets with high growth potential. Last year, we established the Myanmar Branch office to promote locally-oriented management and accelerate decision-making process, by positioning ourselves closer to our Burmese customers, business partners and dealers. Having established Panasonic as one of Myanmar’s top consumer electronics brand, we will concurrently focus on strengthening our B2B portfolio here. 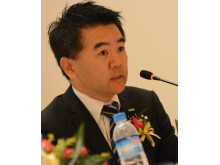 I am certain the Myanmar market will contribute effectively to Panasonic’s global sales target of 10 trillion yen by the end of fiscal year 2018, the company’s 100th anniversary,” said Junichiro Kitagawa, Managing Director, Panasonic Asia Pacific. 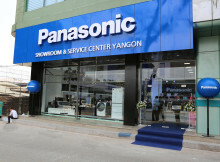 As part of the company’s business strategy to increase customer touch points, two integrated Panasonic showrooms will open in Yangon and Mandalay by March 2015. Both showrooms will incorporate a service centre, providing after-sales support services, and showcase Panasonic’s full B2C and B2B offerings. Panasonic Cooking and Panasonic Beauty corners enable customers to experience the products first-hand. In addition, Panasonic will also improve customer touch points at various sales channels, such as hypermarkets and independent retail shops. Under Panasonic’s global 100 Thousand Solar Lanterns Project , the company donated over 2,000 Solar Lanterns to eight organisations working to address various social challenges in Myanmar. This is on top of the 5,000 sets donated in 2013. “Compared to other Southeast Asian countries, electrification rate in Myanmar is relatively low at 49%. We received positive feedback from the recipient organisations on the utility of Solar Lanterns donated last year, such as how it has significantly helped improve working conditions in hospitals and schools. Hopefully, today’s donation will further contribute to the resolution of social challenges faced by people living in Myanmar’s rural areas,” said Rika Fukuda, General Manager, CSR & Citizenship Group, Groupwide Brand Communications Division, Panasonic Corporation. Panasonic Corporation is a worldwide leader in the development and engineering of electronic technologies and solutions for customers in residential, non-residential, mobility and personal applications. Since its founding in 1918, the company has expanded globally and now operates about 500 consolidated companies worldwide, recording consolidated net sales of 7.74 trillion yen for the year ended March 31, 2014. Committed to pursuing new value through innovation across divisional lines, the company strives to create a better life and a better world for its customers. For more information about Panasonic, please visit the company's website at http://panasonic.net/.